Orphek is set to release several new models at next weeks MACNA in Washington DC. The Atlantik line is going to receive some promising new additions along with a much anticipated upgrade in controllability. With it’s WiFi control and full programming it’s hard to come up with a way to improve upon the Atlantiks but the Orphek R&D team has been hard at work since last years MACNA and we’re sure that you will be impressed. Also debuting will be a new light that is aimed directly at the Public Aquarium market. This light will be suitable for large installations where power and penetration are key factors. The Kaspian brings the Orphek spectrum into a whole new level of light. The Atlantik P300 is also going to be sporting some new features that will allow users to more control and an increased output. For those of you looking for supplemental lighting a new Slimline light will be debuting as well. This sleek looking light is packed full of the Orphek spectrum and will make a great addition to your existing lighting or works great on it’s own for smaller tanks. 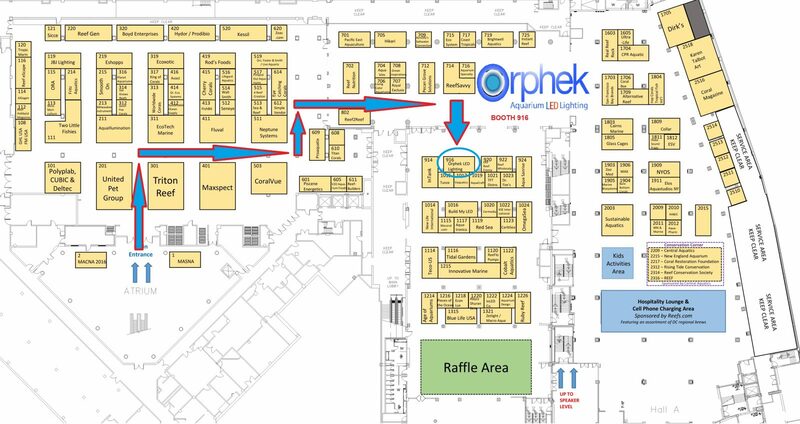 So, if you are going to be at MACNA, be sure to stop by the Orphek booth (#916) and check us out. The entire line will be on display along with that cool little Azurelite flashlight!